I friggin love this lamp! I showed the exclusive premier of it over at Saved By Suzy earlier this week! Now you get to see how I did it! I got my inspiration from Mandi at Vintage Revivals! She made two lamp shades using felt and burlap. I strongly considered burlap for my shade, but ultimately decided on muslin. For one, muslin is $1 cheaper per yard. Second, it doesn't have that strange smell that burlap has. And I just really wanted white on my shade! Here is a ghetto photo of how the lamp looked before. Nothing wrong with it, just boring. First I took the lamp outside to sand, prime, then spray paint. I think the color is Valspar Abundant Gold. It's something like that - it coated great! Be sure to tape off your cord and the top of the lamp. You don't want that getting all funky with spray paint. Then I got to work on the lampshade. This is the time consuming part. Here's the before. I bought three yards of white muslin @ $2.99/yard. I think I have almost two yards left, at least one and a half! With the muslin still folded in half, I made a small incision with my scissors every three inches. Then I ripped all my strips. I decided to do this instead of cutting the strips. It created a more even edge and I like the soft, ruffly look. You can refer to Mandi's post for better pictures of how to do this, but I just folded the three inch strip in half (long ways) and hot glued the end to the lamp shade. Then I glued about every two to three inches in a wavy pattern. Continue this until you're out of fabric, then start with your next strip. Keep going until your whole shade is covered. This part took the most amount of time, but it looks so awesome! After you're done gluing everything there will be thin hot glue strings everywhere. Pull off all the thin hot glue strings (they look like spider webs to me) and pull or cut off any stray threads from the edge of the muslin. This cleans of the appearance of the ruffles and creates that soft edge. I love it the most when the light is on! It creates a real ambient look through the shade! Love it!! I think I wanna do it! This is so cute. I don't think I have enough patience to do it. It looks great, I think I like the muslin best! I love it~it's just so girly and pretty! Love it! I have to get more yellow in my house. That is so pretty! I seriously need to do this to one of my lamps! Love this! 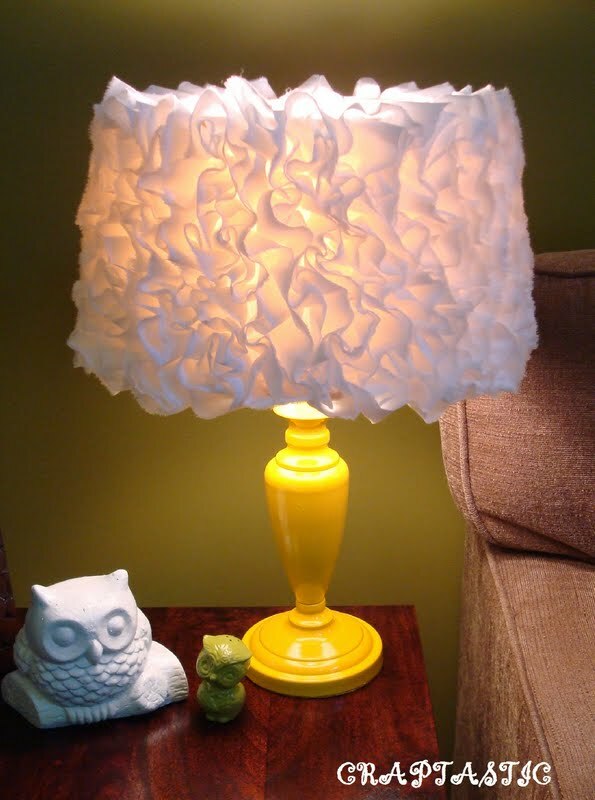 I recently made a ruffle shade too, so easy and makes such a difference! aw, i love this!! so stinkin adorable. i have some pretty boring shades in my bedroom, if i can sum up enough courage i just might try this!! Love it! Coming from a house of boys I am crazy about ruffles these days! It turned out great and I can't wait to try it!! Thanks so much for the instructions! This is gorgeous. I love how the lights shine through. I'd love for you to stop by www.laughloveandcraft.com and link up to my Share the Wealth Wednesday Link Party! I'm your newest follower! I love this lamp! The white ruffles and yellow go really well together. I like your owl too! Gorgeous! Such a great makeover. I'd love it if you stopped by my blog and checked out the giveaway I'm having for a Dremel Trio! I love your lamp. It is absolutely fantastic. You can never have too many ruffles. This is so pretty and girly! I love the ruffles. Thanks for linking! I love it! Come on over and link up to Scrappy Saturdays at candacecreations.blogspot.com! This is so pretty! I love the yellow base! Fabulous job! LOVE your lamp! :) super sweet. omg I LOVE this lamp!! 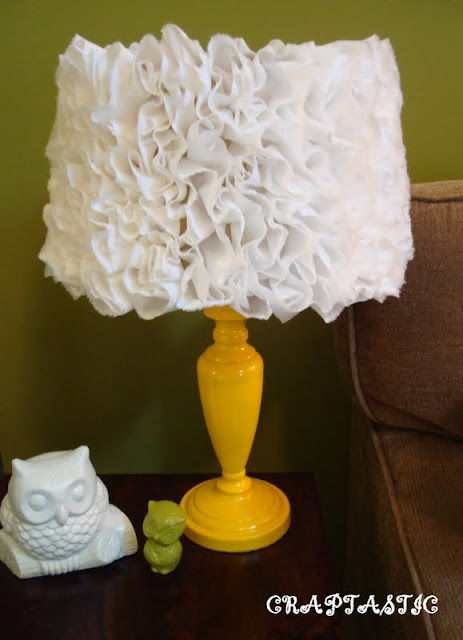 I really want to make a ruffly lamp...and I just LOVE how yours turned out! The yellow is perfect too! !